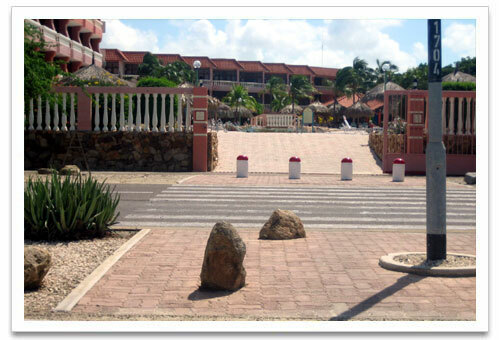 Paradise Beach Villas Aruba is located right across from beautiful Eagle beach. It has 80 spacious standard suites with large balconies and features modern comforts. Some villas have ocean views and other villas do not. It has 2 freeform outdoor swimming pools, hot tubs, and a children’s pool. It has a Tiki Bar and cocktail lounge, barbecue grills, babysitting referral, a beauty salon, Laundromats, convenience store, exercise room, auto rentals, Internet access booth and Wi Fi service. VCR and video rental is available. It offers concierge services, 24 hour security and complimentary parking. The spacious suites are equipped with air conditioning, ceiling fans, telephone and cable TV. It has fully equipped kitchens, with microwave, stove, refrigerator and dishwasher. There is a living room, dining room, and bathroom with Jacuzzi. It also has an electronic safe in each suite. This is a basic standard quiet resort with minimal activities for children or adults.